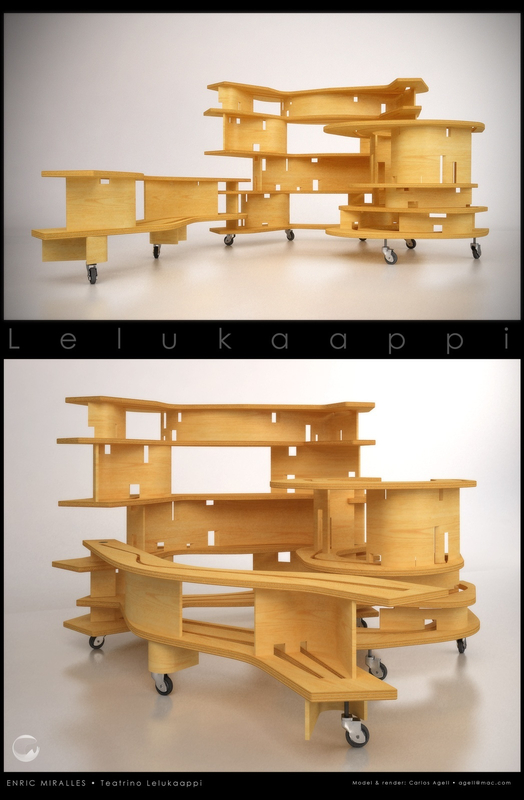 This is a Design of one of my favorite Architects, the catalonian Enric Miralles, is a Small theater/playground for children for the Ludoteca at Mollet del Vallés, based in the concepts of Finnish Architecture an furniture design. There wasnt so much photographic reference, but theres a set of suigeneris blueprints by Miralles that was both amusing and challenge to read and transform into the final piece, all the information is superinposed in one complex blueprint. All was modeled in Cinema 4D and rendered using Vray, with some color correction in Photoshop.